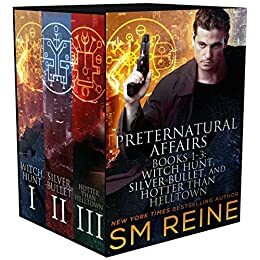 This urban fantasy boxed set contains the first three books of the Preternatural Affairs series: Witch Hunt, Silver Bullet, and Hotter Than Helltown. My name’s Cèsar Hawke. I’m a witch working for a division of the government you’ve never heard about. The world’s not what everyone thinks it is—unless you think that our world’s a pawn in a game of chess between Heaven and Hell, and riddled with as much magic and wonder as it is with evil. In that case, the world is exactly what you think. My place of employment—the Office of Preternatural Affairs—takes a modern approach to an ages-old problem. It used to be that inquisitors would burn demons and the people in league with them. Now we get warrants, perform arrests, put the suspects on trial, and send guilty parties back to the Hell from whence they came with the travel forms filled out in triplicate. This stuff I do with the OPA, it saves lives on most days. There are scratches on Cèsar Hawke’s arms, a discharged Glock on his coffee table, and a dead woman in his bathtub. Yeah, maybe he brought the waitress home for some fun—he was too drunk to remember it—but he knows for a fact that he didn’t kill her. He’s an agent with the Office of Preternatural Affairs. He doesn’t hurt people. He saves them. Isobel Stonecrow speaks with the dead. She brings closure to the bereaved and heals broken hearts. But when she talks to the wrong spirit, the OPA puts a bounty on her head. Tracking down Isobel is the last case assigned to Cèsar before he bolts. If he finds her, he can prove that he didn’t kill that waitress. He can clear his name, get his job back, and bring justice to all those wronged families. She’s just one witch. He’s bagged a dozen witches before. Former private investigator Cèsar Hawke has one rule: He doesn’t deal with dead bodies. That’s why he enlisted with the Magical Violations Department in the Office of Preternatural Affairs. He’s happy tracking down witches that commit petty crimes, but he leaves the homicides to other agents. Except that he’s been assigned to a new team—a team that handles special investigations—and the job has suddenly changed. Now Cèsar has to deal with dead bodies. He also has to deal with necromancers, murderous cults, and demons that can stop a man’s heart with fear. This isn’t the job he signed up for, but it’s the job he needs to do. If he survives the first week. A killer is mutilating bodies in Los Angeles. Agent Cèsar Hawke is on the case, but the murderer is ahead of him—way ahead of him. Wiping the memories of the dead so that the team’s necrocognitive can’t talk to them? Done. Preventing magical reconstruction of the crime scenes? Oh yeah. And the murders keep getting more brutal while Cèsar struggles to catch up. What kind of bad guy is too hot for Helltown?